Due to increasing product changes in electronics production, it is necessary to exchange solder nozzles or readjust flux spray heads or solder pots by hand. The revolutionary VERSAFLUX flux module and VERSAFLEX solder module, which are available for VERSAFLOW 4, set entirely new standards with regard to flexibility and throughput. 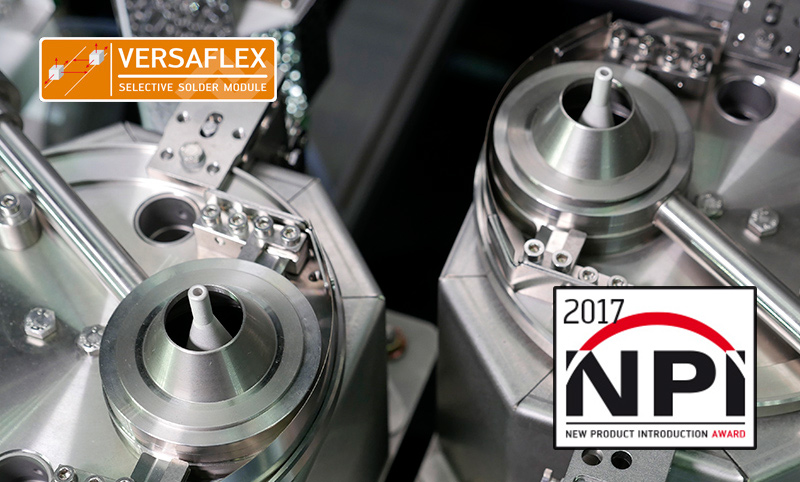 The VERSAFLUX module can be equipped with up to 4 spray heads installed on two completely independent axis systems, i.e. up to 2 spray heads per axis. Application of the flux to the printed circuit board is monitored by laser - resulting in a safe automated process. The VERSAFLEX module as well works with 2 mutually independent axes carrying one solder pot each. Like the already existing Kurtz Ersa dual pot systems the innovative VERSAFLEX module offers substantial added value for the production: doubling of throughput with PCB panels, use of different solder alloys or nozzle shapes without any changes required. Due to the independent axis system, solder pots and spray heads can be adjusted and moved individually in x/y/z-direction. Two operating modes are available: In synchronous mode the 2 axes move in parallel at a predetermined fixed distance to one another, ideal for panel processing. In asynchronous mode each axis follows its own path. However the single assembly is rotated or mirrored within a panel, thanks to the high flexibility of the axes the PCBs are processed automatically and program controlled.